The 90’s are back! Bust out your Dyno BMX Bike and dust off your two-stroke. What goes around comes around, and it looks like Bell is getting their hands dirty with some throwback neon graphics just in time for Spring 2015. 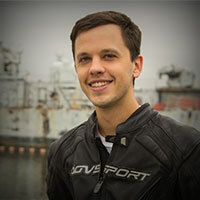 Their work with Roland Sands and own internal design department has really been upping the ante for street and dirt helmet graphics this year. The Bell SX-1 Stack Blue Helmet will match your fluorescent Pink JT Goggles and Fox Gear perfectly, and everyone knows that the bright colors of the 80’s and 90’s are coming back. With this new graphic from Bell, you can be ready, too. The Stack Blue shares its DNA with the SX-1 Helmet, and it offers a solid performing helmet for dirt riders on a budget with protective Polycarbonate shell construction. The Force Flow Ventilation System helps keeps things cool despite such a hot graphic. Plus, the liner is removable and washable so you can keep things fresh even after you have been gettin’ down and dirty. 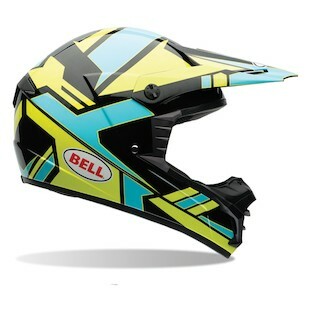 Built on the same frame as the Stack Blue, the new Bell SX-1 Storm Helmet is another graphical option that infuses a bit of energy into the off-road game. Coming in every color of the rainbow, the Storm is set to match whatever outfit you are rockin’ already, or any that you may have in mind for the future. Aggressive, well-designed, and at a great price point, the Storm helmet is right for anyone who wants to give it a go. 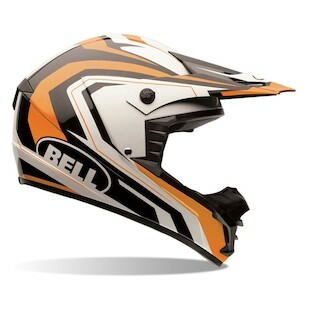 Ultimately, Bell is keeping its helmet line up-to-date with some new graphics that ooze with bright colors to pop in the spring sunshine. Plus, with the same five-year warranty the rest of their helmets carry, you can count on a dependable service life, too. The Stack SX-1 delivers in spades, and is a great choice for dirt riders on a budget looking for good visibility and an interesting, modern graphic.